The enchanting beauty of the land of Komodo dragons is out and now travelers from all around the world flocks to the far flung haven. Now, trip to Komodo National Park, Flores, is not just like any trip. Aside from its rugged and outlandish lands, destinations are dispersed among more than 20 little islands—with one of world’s best marine park in between. This is a sailing trip featuring island excursions, dragon hunting, and diving expedition all in one package. 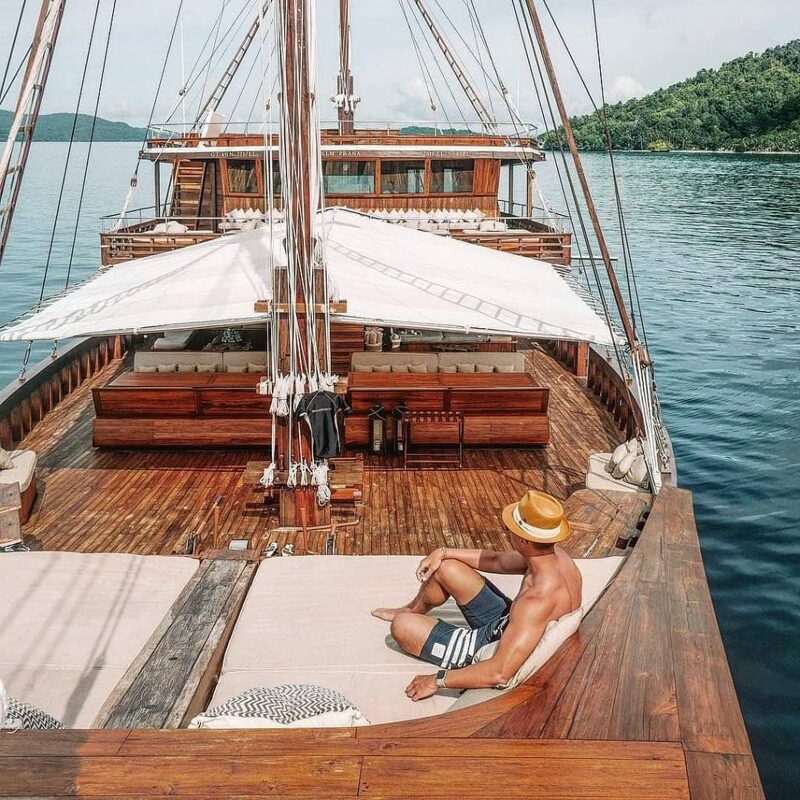 And to ensure the success of the sailing trip, one should have meticulous preparation for three days and more on Flores’ famous Indonesian wooden ‘phinisi’ boats. It’s actually quite easy to put together a list of what to pack and when you are preparing your first Komodo boat trip. Unless you are sailing on luxurious, private yacht, spaces on boat are generally limited. Don’t bring a bag that couldn’t be pushed on small closet self or slide under a bunk. Definitely don’t bring a suitcases. They take up TONS of room and their wheels can hurt the boat’s wooden deck. On a liveaboard Komodo, no one cares whether your hair is blown dry and stay silky smooth after plunging in the water. For most women, make up pouch could be very bulky and take more spaces than all your underwear combined. Leave your heavy beauty supply home. Only take the essentials—like sunblock—and pack them into travel-size bottles. With so much diving, snorkeling, and hiking, you won’t have the time and necessity to wear makeup anyway. Komodo boat trip usually got very lively with stories and anecdotes between fellow travelers. If you are naturally outgoing, you might find it difficult to stop yourself from all the talking. It’s just very fun to gather around and discuss what’s happening on previous/ next destination! But if you are on more introverted side, this could be quite a challenging situation. Pro tip: bring a conversation starter piece that invite people to throw a comment on it. The number one rules on clothes for travelling: pack wrinkle-proof, quick-dry fabrics that you won’t mind to wear for two to three times. The benefit of travelling on Komodo boat trip is, you will have access to blazing hot tropical sun everyday—means you can hang your clothes to dry. Also, pack extra pair of swimming suits/ shorts. You will have A LOT of water activities and you need something to wear while waiting for the other swimwear to dry. When you are travelling in hot and windy Komodo, you’ll want to wear something that would be friendly to the winds and water. Hats that won’t get knocked off by the wind as easily and sandals that would stay put in the water (and dry as quickly when you’re back on land). Simple flip flops may look very practical, but they quickly loosen the moment you get into the water. Go with rubber sandals that won’t be slipper on the deck and won’t float for water play in the beach. Outdoor Camping: A Boost to Your Mental and Physical Health?